"Can you guess what we're doing tomorrow after school?" I excitedly asked my daughter, a big fan of Cynthia Rylant, on Wednesday afternoon. She shrugged her shoulders instead of providing a guess. 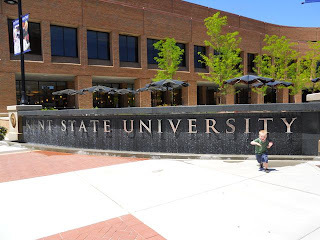 "We will be heading to Kent State University to look through boxes of Cynthia Rylant's stuff." The response was exactly what I expected from my daughter -- super excited, but she stopped and looked at me, maybe a little puzzled. Then, I clarified, "We get to look at her stories -- before they became books -- some she wrote in her own handwriting -- like Henry and Mudge. Some of the stories are typed too." She responded, "I have to go downstairs. I have to type something!" 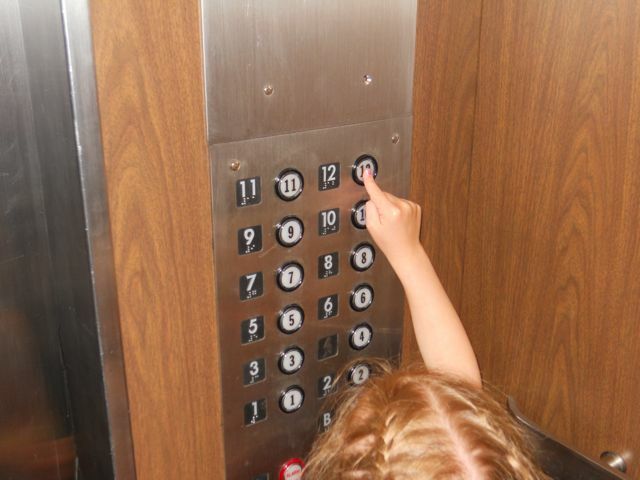 I had no idea what she doing, and I don't think she knew either. She stared at the open Microsoft Word document and I asked, "Do you need help? What are going to type about?" She said, in a tone of voice to suggest I should have already known, "I need to tell them thank you for letting us come." 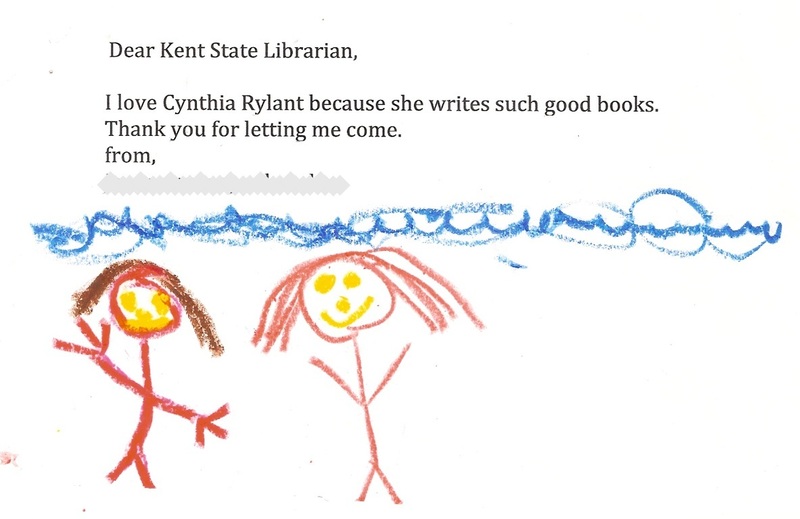 Then, I suggested starting with "Dear Kent State Librarian" --which was just enough to get her going on her own. This week I learned that Cynthia Rylant received her Master's degree from Kent State University School of Library Science in 1982. Then in 1983, she worked for the Akron Public Library (which is very near our home). I thought going to the library where she had worked would be the perfect way to celebrate Cynthia Rylant's birthday. 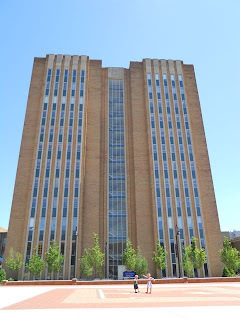 However, after contacting the library's Youth Services Department I found out from the Youth Services Coordinator, Carolyn Burrier that "Cynthia Rylant worked in the Akron Public Library system for about eight months in 1983. She worked at our Chamberlain Branch. Since then the branch has been moved, rebuilt, and renamed. It is now the Firestone Park Branch on Aster Ave." I replied to the email simply thanking her for answering my question, and I am sure my one sentence response sounded full of disappointment. Thankfully, her return email suggested calling the Special Collections Department at Kent State University to inquire about the Cynthia Rylant papers. I immediately viewed online the list of materials available at Special Collections and my disappointment quickly transformed into pure excitement. I scheduled an appointment to view two boxes of Cynthia Rylant's "stuff" after speaking with the very helpful Public Services Librarian in Special Collections, Amanda Faehnel. 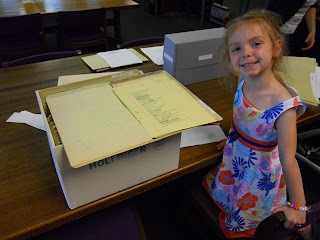 The boxes I chose to view with my children contained handwritten and typed drafts of her beloved series Henry and Mudge, her Newbery Award Winning book Missing May, and many others. The boxed also contained photographs of the "The Real Mudge" which along with her son, Nathaniel was inspiration for the Henry and Mudge series (mentioned by Anita Silvey), and photographs of Cool Ridge, West Virginia where she lived with her grandparents after her parents' divorce. According to Ohio Reading Road Trip her experience in Cool Ridge was the inspiration for her first picture book, which was awarded Caldecott Honor, When I Was Young in the Mountains, and Rylant said, "It was hard for me, being away from my parents during that time, and so maybe everything I felt during that time I felt more intensely. And when you write stories, it's always the most intense feelings that come out." 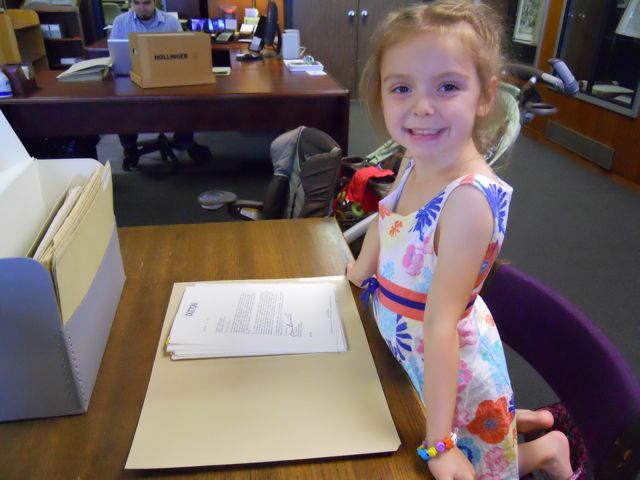 Lastly, my daughter was very excited to see many letters including one from Steven Kellogg. 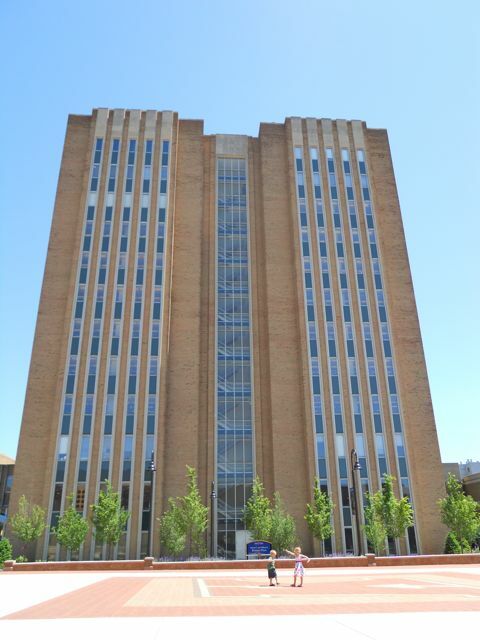 Once we got on campus I stopped to ask for specific directions and I was told to head for the really tall building. My children were excited that Special Collections was on the twelfth floor! This is not your ordinary researching bunch! Notice the nice display cases in the back. Those became my youngest son's favorite thing to bang on while we were there. I once again have to thank the staff and the other researchers that were present for accepting us for the afternoon! The first thing my daughter wanted to see was the letters, especially the one from Steven Kellogg. In the letter Kellogg responds to Rylant's request to illustrate her story, The Elf Cat. He suggests sending the manuscript to a publisher first which will then lead an illustrator. In the picture above my daughter is viewing letters from Dutton Publishing accepting and agreeing to publish When I Was Young in the Mountains with illustrator Diane Goode. The letter was dated 1979 and Rylant was offered a contract with an advance of $1,000 with a 4% royalty. We also viewed many manuscripts including the handwritten draft of Henry and Mudge and the Wild Wind. It was very cool to see the editing choices that Rylant made to her writing. 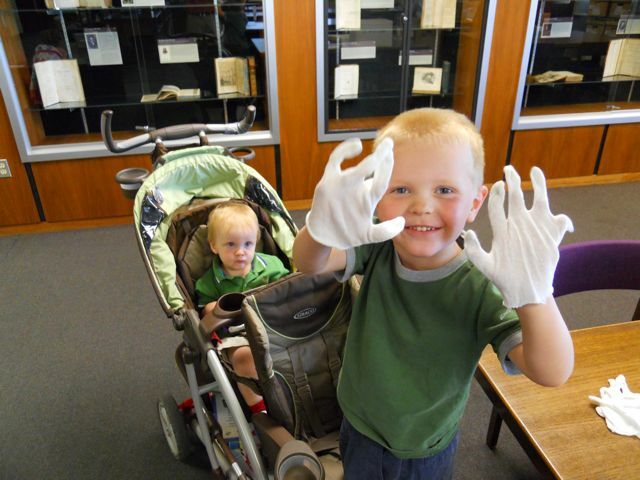 My children learned that white gloves need to be worn when handling photographs. My son enjoyed trying on the white gloves. My son was starting to get a little antsy. But, I told him that the librarians had a surprise if could hang in just a little bit longer. The surprise was to view the Dav Pilkey papers. Pilkey and Rylant met and became companions after their time at Kent State. His surprise was to view a Captain Underpants dummy book complete with pencil sketches! Here is my daughter with the dummy book. On the top of the first page it said, "Edited by Cynthia Rylant (in green pen)." My daughter looked through the pages and pointed out some of the green pen marks. 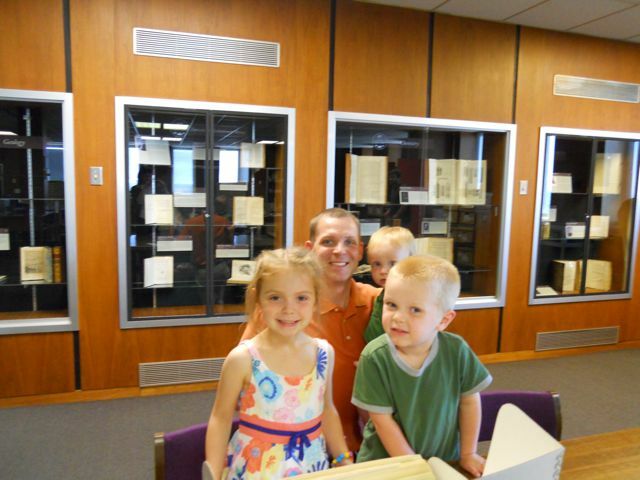 I want to thank all the librarians who helped make this experience possible for my family. My local librarian got the ball rolling by suggesting the people to contact to find out more about Rylant's local connections, the Akron Youth Services Coordinator for suggesting Kent State University's Special Collections, and the Kent State Special Collections Librarians who were so helpful and accepting of my children. We will remember this birthday celebration for a long time! I want to leave you with my favorite quote from Cynthia Rylant that I read this week, from an interview posted by West Virginia Center for the Book, "When children ask me how to become better writers, I always tell them to go out and play. Sometimes you just miss too much sitting in front of a table with a blank sheet of paper in front of you. It's really important to just live life and wait for inspiration and write when your heart -- or your humor -- moves you to." 3. Cynthia Rylant Activities - BrainPop Jr.
4. Biography - Ohio Reading Road Trip, Educational Book and Media Assoc. Great idea for a birthday celebration, Eric. I love looking at old letters but the edited manuscripts and dummies must have been so interesting. Sounds like the kids had a good time too! Dana -- It was very cool. There were handwritten manuscripts and typewritten manuscripts from Rylant. 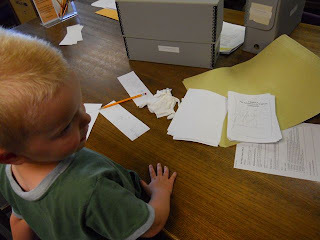 We even made lots of copies. We keep the copies of the manuscripts with our copies of the books! Love that thank you note! 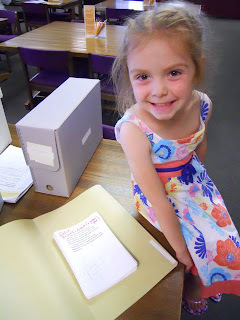 And what a great treat and outing to see an author's manuscripts before they were published. This is truly a great experience for a kid, ERic, and a super way to celebrate Cynthia Rylant's birthday! Joanna, it was a very memorable experience. 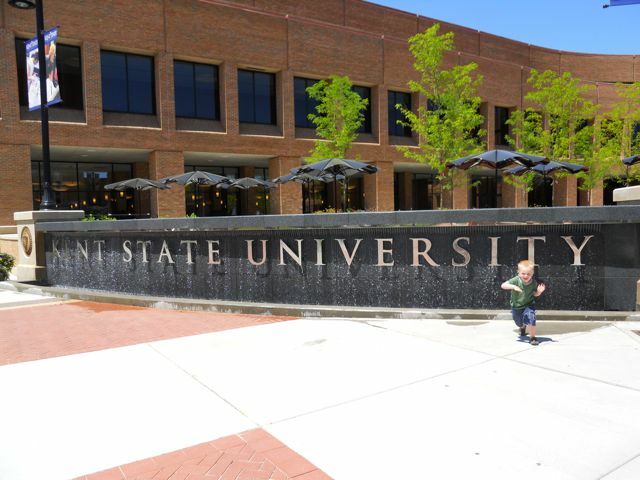 The staff at Kent State was so helpful and my kids loved it!